Replica by Lauren Oliver continues to prove my theory or at least opinion that everything Lauren Oliver writes is brilliant. Sure, I am absolutely a fan girl of her work. Objectively though, I can say that she’s an author who takes all kinds of risks with her writing and is not afraid to try things that are different. I love that her work crosses all kinds of genres. Replica is a book that will have me pondering the story and the themes for quite a long time. Replica is a dual storyline book. There’s two main point of view characters and essentially it is like two books that follow the same plot line from different points of view. One half is about Lyra, the other half is about Gemma. Lauren Oliver tackles cloning and more specifically what makes someone human. There are actually a whole lot of questions that this raises about humanity. Also about how we treat each other. You see, this book shows a society that abhors clones – or replicas as they are called in this book. It is a bit reminiscent of today and how society treats outsiders and those who are different. Of course, there’s also a little bit of romance involved. As well as a whole lot of action. So, I suppose you could say that Replica by Lauren Oliver is a thoughtful book that maintains engagement while you ponder the larger implications of humanity. Also, wow that truly sounds like I am bullshitting, but in fact, that’s how I truly feel about this book. Lyra is the replica mentioned. I actually read her half first. When we open Replica, Lyra is living on an island. She has no access to the outside world. The island is shrouded in mystery. There’s only doctors, nurses, guards and other replicas. One day there is an explosion and Lyra’s world is on fire. There’s all kinds of action and she encounters Gemma who is not from the island or a replica, but who looks just like her friend Cassiopeia. Lyra, along with a male replica, makes her way to the outside world for the first time ever, and there’s all sorts of action. I will say that I didn’t totally gel with Lyra’s half. However, her perspective is just so different and interesting – I felt like her character was a bit of a tabula rosa because she doesn’t have the full range of human experiences, being raised the way that she was. 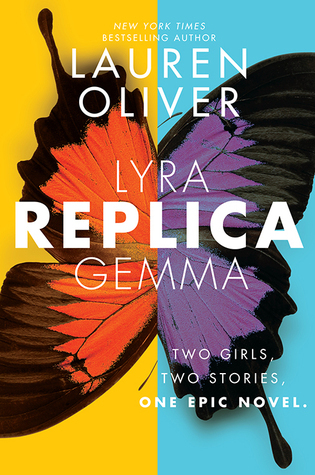 Gemma was definitely the character in Lauren Oliver’s Replica that I connected with the most. Her half was probably my favorite — because I could relate to her experiences kind of sort of. I mean, she thinks that she’s too heavy (she’s not). She also has really overprotective parents. OH AND she only has one friend who happens to be named April who is actually pretty great overall (just like me). Anyways, so Gemma has a history of being ill pretty easily. She also has parents who are super loaded. Anyways, she ends up going on spring break for the first time ever and then somehow ends up on the island of replicas just as there is an explosion. When her path crosses with Lyra, all kinds of secrets about her past and such come out. I loved the spectrum of emotions that Gemma experiences. I loved how dynamic her character got to be. So, the cool thing about Replica is that if you are reading the physical copy you can choose how you want to read the book. You could read all of Lyra’s part first and then Gemma’s. Or you can read all of Gemma and then Lyra. OR you could go really wild and alternate the chapters. It’s so cool because some chapters cover the exact same event but from the different perspective of each girl which as a reader gives us sort of a bird’s eye view of the whole thing where we have a more complete picture than either character. I really loved the risk that Oliver took with this book, as I have not read anything like it. I cannot recommend Replica enough. It is a smart, unique young adult book. None yet — but I am writing this in May soooo we shall see soon enough! Every time I see a review of a Lauren Oliver book – they all always have such praise for her stories – I say to myself “I really need to read her work”. Apparently today is not exception. XD I’ll have to keep an eye out for this Replica. I love the idea of two stories in one, with the flipbook nature. That’s the way I think those sorts of things should be done: built in to the same greater story, rather than what seems to be a blatant money-grab, you know? In this case it seems to make the story far stronger, and I appreciate that greatly. This looks so good! I have to read this! Thank you for letting me know it exists!